From the moment you enter Harris Beach State Park, you will be blown away by the rugged natural beauty of the largest island off the Oregon coast. Marvel at the scenic rock formations surrounding the sandy beach, creating colorful tide pools, perfect for bird and marine watching. In the summer months, swim, paddle, and dip your toes in the sand. In spring and fall enjoy some of the best kite flying amid spectacular sunsets. Admire the breathtaking ocean and forest views, take the kids to the children's playground, hike and bike challenging trails to town or watch the wildlife at the Oregon Islands National Wildlife Refuge, just across the way where you can sometimes spot puffins nesting on a rocky island. Where are the Harris Beach State Park tide pools? Tidepool exploring is a must at Harris Beach State Park. Access one of Oregon’s seven designated marine gardens from a short trail near the campground entrance. Marvel at the beautiful rocky coves and Arch Rock, where waves crash through the arched opening. In low tide, look out for sea stars, green anemones, hermit crabs and many other fascinating creatures on land and water. How do I get to the Harris Beach State Park Trails? 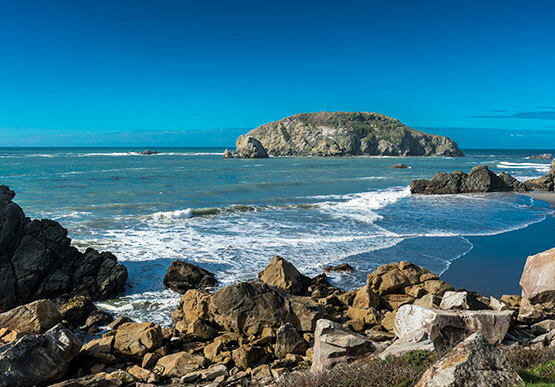 Located minutes from the entrance at Harris Beach State Park, the scenic walking paths lead to spectacular hiking trails perfect for challenging climbs and casual strolls. Sunset Point Trail follows the coastline offering unparalleled ocean views while the South Beach Trail follows 1.2 miles to downtown Brookings. Avid hikers will want to head to Samuel H. Boardman State Scenic Corridor that lies just north of Harris Beach and is one of the most scenic in the state.